Taste of Edmonton: is this it? Mack remarked to me today that it must be some week, given we’ve had lunch together twice in seven days (something that rarely, if ever, happens!). But it has been a special week in Edmonton, given that not one, but two new food trucks have debuted downtown. 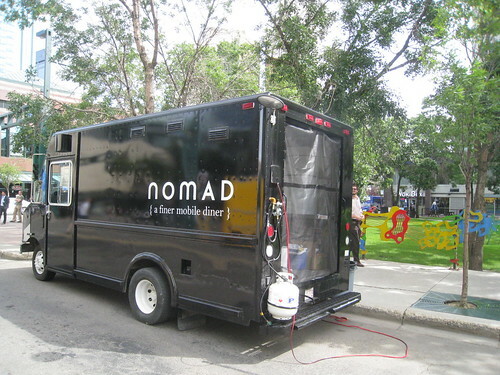 We checked out Drift Mobile Eatery (parked at 108 Street and Jasper Avenue on weekdays) last Wednesday, and today, decided to meet up to try Nomad. 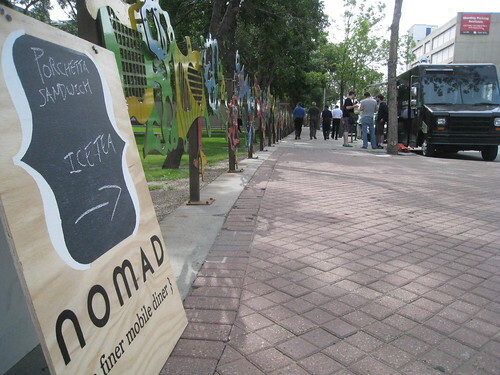 Parked at 102 Street, just south of Jasper Avenue, Nomad isn’t surrounded by towers, but its location does benefit from being next to a shaded green space made for a picnic (now, if only there were tables in that park…). They’ve only been open for four days, but chef/proprietor Mike Scorgie told us that they’ve had a great response so far, and sold out of food on two of those days. Nomad’s menu changes daily (follow them on Twitter to be in the loop), but based on our experience, you can’t go wrong. Our two options today were a veggie chili ($6) and a porchetta sandwich ($7.50) served with an arugula and smoked tomato salad. Of course, Mack and I both opted for the latter. 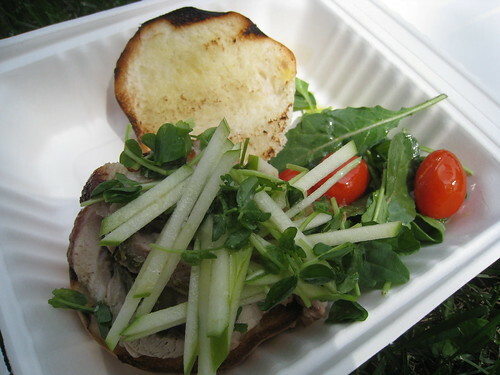 The porchetta had been smoked then barbecued, sliced and served on a bun with green apple and pea shoots. The generous portion of meat was moist, with a good mix of lean and fattier pieces. 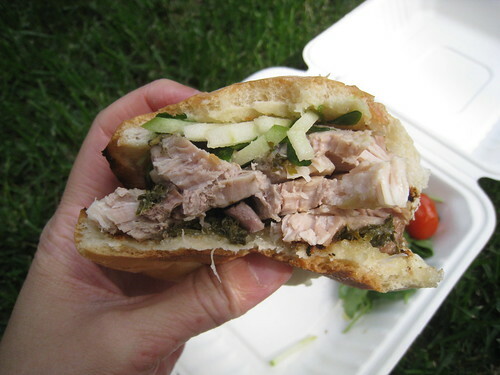 I liked that the bun was toasted, and the added texture and sweetness from the fruit and greens was perfect. Mack isn’t usually a fan of salad, but between the vinaigrette and tomatoes that just popped with flavour, he didn’t complain! We also tried their homemade iced tea, sweetened with molasses. It was a unique twist on a quintessential summer drink. The only minor quibble we had was with better signage – Mike said they do their best to source products locally (the pork was from Brûlé, Alberta, and the tomatoes were from the farmers’ market), but it would have been nice if that was indicated somewhere on the truck. 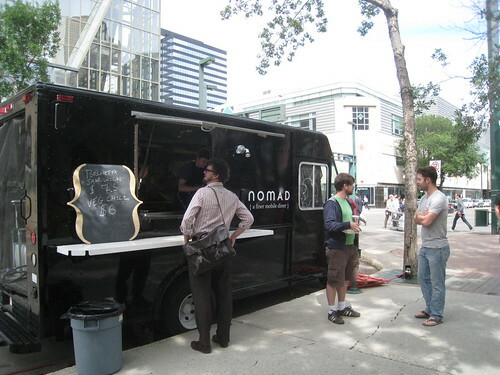 Offering creative food made with care, Nomad is very much a welcome addition to Edmonton’s food truck scene. Check them out when you get the chance!